Models of Polikarpov biplanes seem to be a bit like the bus service here in England, you don't see one for ages then all of a sudden they appear in pairs one after the other, not that I'm complaining, well not much. First there was the Classic Airframes I-153, not a bad kit but the cockpit detail was fragile as it was made from etched brass. Then nothing for ages apart from the re-issue of the Classic Airframes I-153 by Flashback albeit with some extra resin bits, but still with that best replaced etched brass cockpit detail. 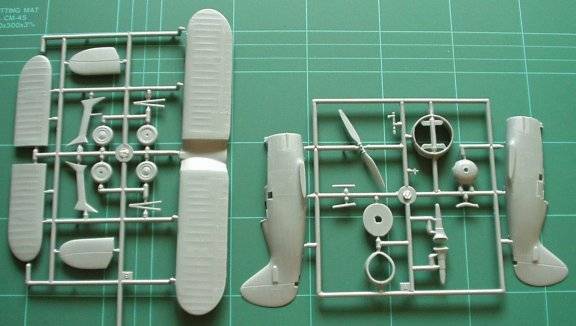 Suddenly Classic Airframes release a new 1/48 scale Polikarpov the I-152, this new kit seems quite good and they have replaced the etched brass cockpit detail with some lovely resin, unfortunately it does NOT FIT, well not from the box or with the alterations they indicate the modeller should make. I have purchase 2 of these and I intend to use that resin, I'll come back later and tell you how when I've done it, but I suspect days of sanding will be involved. Shortly after the release of the Classic kit, or so it seemed Special Hobby announced their intension to release a 1/48 scale model of yet another Polikarpov biplane, the I-15. Some moths later E. D. Models informed me that they had received it, and it was waiting collection. What you are about to read are my impressions of this model, from opening the box to later scrutiny against plans in the Polygon "Warbirds" No1 book, and information contained within the first volume of Soviet Combat Aircraft. 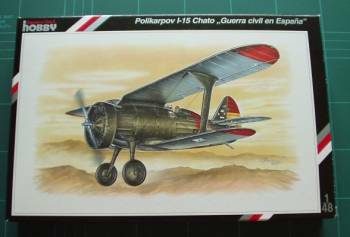 The model comes in a card end opening box, some nice art work depicting a I-15 in Spanish Civil war markings is printed on both top and bottom. Well how do I translate my joy and pleasure on first opening the box into writing? 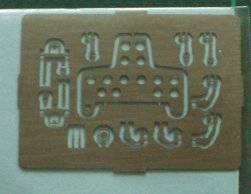 What you get for your money is this: - 26 moulded plastic parts (Slightly soft grey plastic, for those who like to know these things), 13 parts of photo etched brass, 1 photo negative instrument panel, 39 bits of resin, two sets of vac form canopy / side window and finally decals for 3 Spanish Versions. The plastic is well moulded and quite finely detailed with delicate engraved panel lines, on my example there was no flash to speak of. Test dry fitting indicates that the fuselage will require pulling together at the front end, as a slight gap is evident, should not create any great problem to the average modeller. The top wing is a single moulding and appears to be a good fit on to the fuselage; I expect little to no filling in this area. The resin parts are for the cockpit and engine, I must say here that I have started making the engine already and it is a beautiful little thing with such details as push rod apertures already cast into it. The cylinders are positively located, having circular mounts that push into holes in the crankcase, you then have to attach the separately cast heads. The remaining resin details the cockpit, a floor, rear bulkhead and side walls being the main components, added to this is the seat, 2 sets of entry doors (Early & Late) interior cockpit frame work, instrument panel, head rest and finally rudder pedals, all are extremely well detailed and cast. The items that I have removed from the casting blocks separated quite readily, thought I would recommend great care as the parts are very fine. Dry fitting would indicate that the resin cockpit will require little or no sanding of it or the fuselage interior for it to fit; some other manufactures could learn a thing or two from these people. The photo etched supplies the instrument panel face on to the rear of which you attach the photo negative of the dials, the other photo etched supplied is for other smaller details such as control horns. I compared the model parts against the plans in the Polygon WARBIRDS No1 and things did not look too good, the wing was too large in span and cord, the fuselage was too long. OH NO was my thought, but then I checked the drawings own measure bar which reports to show a length of 3 metres. The measure bar is 60mm long and this equal 1/50 to my calculations, result the drawings are not any use to check a 1/48 scale kit against, apart from using them as reference for positioning of elevators, panel lines and the like. The only thing to hit me in the face when doing so, is the drawings show the underside of the fuselage having more of a curve upwards towards the engine than appears on the model. My next check was carried out using the dimensions given in both books. Both publications state that the top wingspan was 9.75metres, this scales down to 203.125mm, the kit wing is 206mm, so it is all of 2.875mm over size, big deal. Both quote the length as being 6.1 metres, this equals 127mm in 1/48 scale, now while I admit the fuselage has yet to be assembled so my measurements might not be spot on I make it about 120 to 123 without the prop in place (engine cowling held in place as best I could), so I don't think it is that far out. 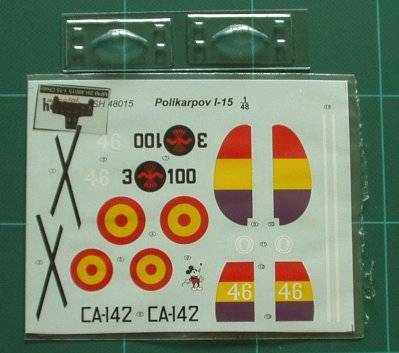 The decals supplied with the model are all for aircraft operated by the Spanish during or shortly after the civil war, if you wish to represent an aircraft operated by the Soviet VVS replacement decals from the spares box we all seem to have will allow you to do so, or wait a while and some one is bound to bring out a set I am sure. The truth is the proof of the pudding will be in the eating, or in plain English in the making of the kit. I will say that the Special Hobby looks like a easier build and is far cheaper here in the UK than the Classic Airframes offering, so if you only have money for one Polikarpov I would recommend the Special Hobby I-15, well done Special Hobby. I would like to say that both manufactures should be praised for producing models of aircraft other than Spitfires, Mustangs or Messerschmitts and I can only hope that they sell well and encourage the release of other Soviet WWII aircraft models.